While working on our multi-part series of posts about the history of codebreaking in America during the 20th century, I mentioned that some of the recent revelations about the National Security Agency were the result of Edward Snowden’s actions during his time as a government contractor. What you might not know is that he has not been the only contractor to sneak information off of government computers in that fashion: a decade before Edward Snowden, there was Brian Patrick Regan. Regan was a career soldier in the Air Force who eventually reached the rank of Master Sergeant and worked in signals intelligence. Buried under hundreds of thousands of dollars in credit card debt, Regan decided his only way out of financial ruin was to try to sell US government secrets to a foreign government. He copied page after page of sensitive documents from national defense systems and snuck them out of his office, eventually amassing more than 15,000 pages, CD-ROMs, and other material in his home. He would later bury bundles of these documents in various locations, including state parks, concealing the GPS coordinates of these valuables caches through a complicated series of encryptions where letters and numbers became three-digit sets. You see, Regan had spent a fair amount of time studying cryptography, and fancied himself a top-shelf codemaster. Regan used another set of encryptions of lesser complexity when he attempted to contact agents of the Libyan, Iraqi, and Chinese governments in order to sell off the treasure trove of secrets he’d amassed during his time at the National Reconnaissance Office. One of these packets — a collection of three parcels intended for Libya — ended up in the hands of an FBI agent named Steven Carr. In the first envelope was a four-page letter with 149 lines of typed text consisting of alphabets and numbers. The second envelope included instructions on how to decode the letter. The third envelope included two sets of code sheets. One set contained a list of ciphers. The other, running to six pages, listed dozens of words along with their encoded abbreviations: a system commonly known as brevity codes. Together, the two sets were meant to serve as the key for the decryption. Some of the document had already been decrypted by FBI agents, and it revealed a member of the US intelligence community — claiming to be CIA, which was unverified, but definitely someone with top secret access — was trying to sell government secrets. And this person had terrible spelling. Brian Patrick Regan suffered from severe dyslexia. And, despite concerted efforts to perfect both his encryptions and his plan to net millions by selling government secrets, that dyslexia would be one of the clues that led Steven Carr to Regan’s doorstep. It took Carr six months to connect Regan to the Libyan package, but once he did, surveillance on Regan began immediately. When Regan attempted to board a plane to Zurich in 2001 — intending to meet with Iraqi and Libyan embassy officials — he was nabbed by the FBI and taken into custody. On searching Regan, officials found a piece of paper tucked between the inner and outer soles of his right shoe, on which were written addresses of Iraqi and Chinese embassies in Europe. The other materials they found on him and in his belongings were more mystifying. In a trouser pocket, Regan was carrying a spiral pad containing a page with 13 words that didn’t add up to anything: like tricycle, rocket and glove. He had another 26 random words scribbled on an index card. Among the contents of Regan’s wallet was a piece of paper with a string of letters and numbers that read “5-6-N-V-O-A-I …” And in a folder he was carrying in his duffel bag were four sheets with handwritten lines of three-digit numbers. FBI cryptanalyst Daniel Olson decoded some of the messages found on Regan when he was captured, but he had failed to unravel the multi-stage encryptions that concealed where Regan had buried his secret parcels. The government knew which state parks, but with acres and acres of possible hiding places, they needed more precise information. And those parcels were the key, because they weren’t just packages to be sold to the highest bidder. No, those parcels doubled as a ransom in order to secure a better deal for himself with the US government. He wanted to blackmail the government for a reduced sentence. They were his insurance plan. Thankfully, Regan eventually realized that cooperation was in his best interest, and he revealed that each of the elaborate three-digit codes concealed a backdoor key built into the code itself. Regan designed them this way so that, if he forgot the actual details of the encryption, all he would need is the starter word, a spark that would unlock the built-in key and help him decode the entire message. 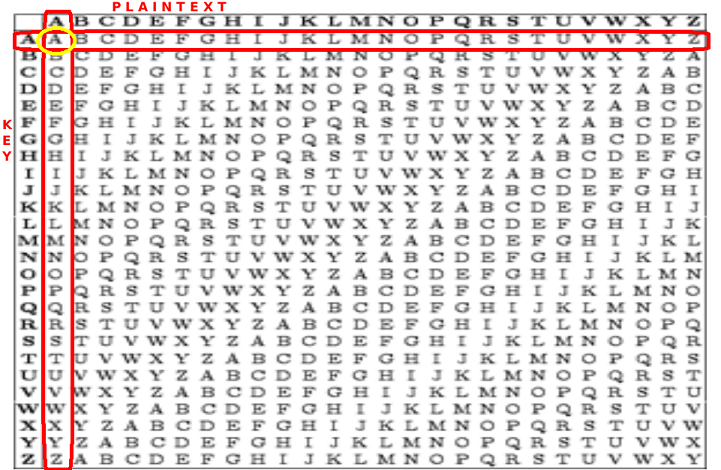 This backdoor key system worked in a similar fashion to the Vigenere cipher, where a keyword or key phrase served as the entry point for a longer string of encrypted text. The trouble is… you need to know the cipher word or source in order to crack the code. For example, during World War II, German agents in Europe used Daphne du Maurier’s Rebecca as the basis of a code for transmitting intelligence from Cairo to support a campaign by the Axis powers against the Allies in North Africa. The discovery of the book among the possessions of two German radio operators who didn’t read English ultimately led to the breaking of the code, which in turn led to the capture of the German spies in Cairo. 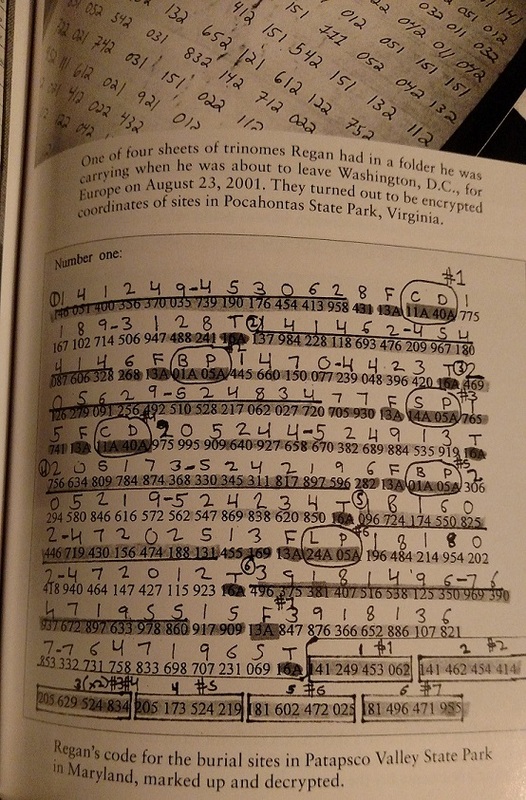 Regan revealed the cipher words for the various hiding spots in state parks — which used cipher words from sources as peculiar as Regan’s own high school yearbook — and soon, the FBI recovered all but one of the buried parcels. 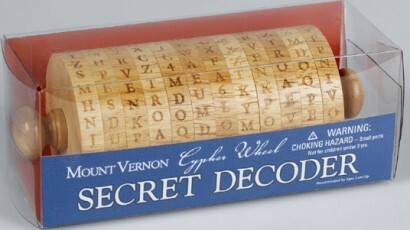 But Regan couldn’t remember the cipher word for the last one. Daniel Olson would then step in, having learned some of Regan’s techniques as they uncovered the other parcels, and partially decrypting the remaining message enough to spark Regan’s memory. Regan finally came up with the last cipher key, and the final parcel was recovered. Yes, once again, puzzly perseverance had saved the day! 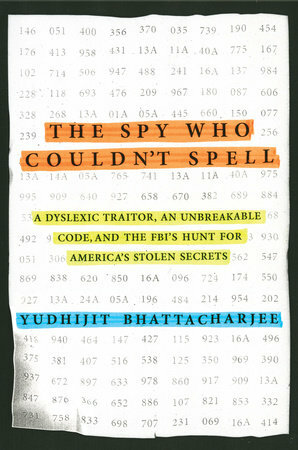 For the full story, including more in-depth explanations of Regan’s elaborate encryptions, check out The Spy Who Couldn’t Spell by Yudhijit Bhattacharjee.